We’ve created an environment that makes the Inn & Spa at Cedar Falls an ideal place for Hocking Hills weddings. The Inn’s 75 acres is perfectly suited for small, intimate gatherings of up to 40 people. Make your wedding unique and unforgettable by allowing us to help you envision, create, plan, and fulfill your special day. Your every last wish is delightfully anticipated. 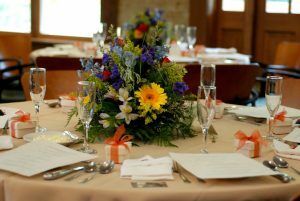 The Inn is also a wonderful place to hold other events, including rehearsal dinners, bridal showers, or a girls’ spa day prior to your wedding. Stay connected with free Wi-Fi. The Gathering Place is a 2,500 square-foot, fully handicapped accessible space featuring an open layout. It is partially built from an 1840’s log cabin, and boasts gorgeous views of the Hocking Hills with plenty of warm natural lighting. A covered outdoor wraparound porch furnished with comfortable chairs and rockers offer even more space. The Fireside Lounge is perfect for smaller weddings. It has a more intimate 450-square-foot living room with a windowed area and log fireplace. Our covered porch extends around this room as well. The Hilltop Garden is beautifully landscaped with local flowers, fruit trees and benches. Brides desiring an outdoor wedding make this an ideal setting. It offers sitting or standing room for up to 40 guests. The Rooftop Garden is a 1000-square foot rooftop herb and flower garden with walking paths. There is a small gazebo and it is ideal for smaller weddings of up to 20 people. The Inn’s centrally located Common Room provides space for up to 20 people. The outside porch and veranda overlook a spectacular view of The Inn’s gardens and make it an ideal entrance for the bride. We came here to marry and start our new life together…could not have picked a better place. Couples massage at our intimate spa. The cost of this complete package is $3,999 plus tax and gratuity. The cost of this complete package is $9,999 plus tax and gratuity. Many options are available for dinner from a buffet to BBQ to a five course meal. Prices vary from $35-$75 per person depending on your selection. An array of fine wines, beer, spirits and champagne will suit all your requests.